356 Marlborough is located on the south side of Marlborough, between Gloucester and Hereford, with 354 Marlborough to the east and 358 Marlborough to the west. 356 Marlborough was built in 1879-1880 by Vinal & Dodge, masons, and William H. Stewart, carpenter, for building contractor George Wheatland, Jr., one of eight contiguous houses (348-350-352-354-356-358-360-362 Marlborough) built in 1878-1880 for him. The land on which 348-362 Marlborough were built was acquired by George Wheatland, Jr., on May 10, 1872, from a real estate investment trust formed by Grenville Temple Winthrop Braman, Henry Dwight Hyde, and Frank William Andrews. It was part of one of several parcels they had purchased on March 1, 1872, from the Boston Water Power Company, of which Grenville Braman was the former treasurer. On May 25, 1872, George Wheatland entered into a trust agreement with William Dudley Pickman and William Pickering Fay under which he agreed to hold two undivided one-third interests in the property in their names and they agreed to assume the obligation for one third (each) of the mortgages on the property. On April 18, 1876, George Wheatland, Jr., sold the remaining one-third interest in the property to his father, George Wheatland, Sr., of Salem. Click here for an index to the deeds for 356 Marlborough. George Wheatland, Jr., subdivided the property into eight lots, seven with 23 foot frontages and the eighth, at the corner of Hereford, with a 24 foot frontage. He then built houses on the lots at 348-362 Marlborough, each of the same design, with the entrance on the left and a bay on the right. The houses probably were designed by architect Obed F. Smith. No architect is indicated on the permit applications. However, the final building inspection report for 354-356 Marlborough indicates that the architect was “F. O. Smith.” There was no architect named Smith with those initials listed in the 1878-1880 Boston Directories and it appears likely it was meant to be O. F. Smith. Obed F. Smith designed a number of houses for George Wheatland, Jr., at this time, including six houses (381-391 Marlborough) of very similar design. 348-362 Marlborough all were started in 1878 or 1879 and appear to have been completed within a year. From the deeds and original permit applications, it appears that 348-350-352 Marlborough were built first, then 354-356 Marlborough, and then 358-360-362 Marlborough. The lots were transferred to one of the three owners of the land as the houses were constructed; each house was then sold after it was completed. The original permit application for 354-356 Marlborough (one application for both houses) was filed on June 11, 1879, by George Wheatland, Jr., and the final building inspection reported was issued on June 3, 1880. On February 3, 1880, as the houses were being completed, William D. Pickman and the estate of William P. Fay (who had died in March of 1879) transferred their two-thirds interest in the two properties to George Wheatland, Sr.
On February 3, 1880, 356 Marlborough was purchased from George Wheatland, Sr., by investment banker and stockbroker Charles Cabot Jackson. On March 18, 1880, 354 Marlborough was acquired from Charles Jackson by John A. Burnham and George P. Upham, trustees for the benefit of Miss Susan Upham under the will of Henry Upham. Susan Upham was the daughter of Henry Upham and his second wife, Rebecca Wentworth (Means) Appleton Upham. Rebecca (Means) Appleton Upham was the widow of Robert Appleton and the mother of Charles Jackson’s wife, Frances Elizabeth (Appleton) Jackson. By the 1880-1881 winter season, 356 Marlborough was the home of Susan Upham and her step-mother (Henry Upham’s third wife), Mary Louisa (McCulloh) Mayer Upham, the widow of Henry C. Mayer and of Henry Upham. They previously had lived in Brookline. Mary Upham’s daughter, Mary Abby (Mayer) Greene, the widow of Dr. John Singleton Copley Greene, Jr., lived next door at 354 Marlborough. During the 1884-1885 winter season, Mary (McCulloh) Upham and Susan Upham were traveling in Europe, and 356 Marlborough was the home of Isaac Tucker Burr, Jr., a banker and broker, and his wife, Alice McClure (Peters) Burr. They previously had lived in West Roxbury. By the 1885-1886, they they had moved to 377 Marlborough. 356 Marlborough was not listed in the 1886 Blue Book. By the 1886-1887 winter season, it was once again the home of Susan Upham (Mary Upham was no longer living with her, and by 1890 was living at 354 Marlborough). Susan Upham continued to live at 356 Marlborough in 1890, joined by Miss Susan W. Vincent. During the 1891-1892 winter season they were traveling abroad and 356 Marlborough was the home of retired East India shipping merchant Alpheus Holmes Hardy and his wife, Mary Caroline (Sumner) Hardy. They previously had lived at 20 Chestnut. By the 1892-1893 season, they had purchased and moved to 445 Beacon, and Miss Upham and Miss Vincent were living at 356 Marlborough once again. 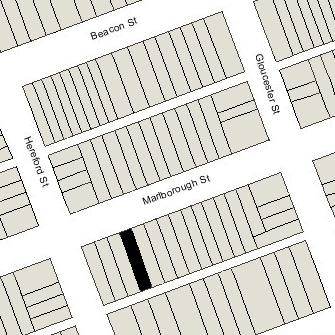 By 1894, Susan Upham and Susan Vincent had moved to 357 Marlborough. During the 1893-1894 winter season, 356 Marlborough was the home of attorney Henry Bromfield Cabot and his wife, Anne Macmaster Sturgis (Codman) Cabot. They had been married in November of 1892 and 356 Marlborough probably was their first home together. They continued to live there during the 1894-1895 winter season, but moved soon thereafter to Brookline. It was probably soon after the Purdons acquired 356 Marlborough that an additional story was added. It is shown as a three story house on the 1897 Sanborn map, but as a four story house on the 1898 Bromley map. The Purdons’ three unmarried children — Maria, James, and Clara Ethel Purdon — lived with them. Clara Ethel Purdon married in November of 1901 to William Arthur Dupee, a wool merchant, and they moved to an apartment at the Hotel Royal at 295 Beacon. James Purdon, an architect, married in October of 1905 to Josephine C. Wilson, and they moved to an apartment at 405 Marlborough. Clara Purdon died in April of 1907. John Purdon and their daughter, Maria, continued to live at 356 Marlborough in 1908, but moved to Milton soon thereafter, where he died in April of 1910. By the 1908-1909 winter season, 356 Marlborough was the home of Dr. Samuel Robinson, a physician, and his wife, Ellen Derby (Bellows) Robinson (he is listed in the Blue Book without his wife, but this is probably a typographical omission). They had lived at The Marlborough at 416 Marlborough in 1908. He maintained his office at 374 Marlborough. 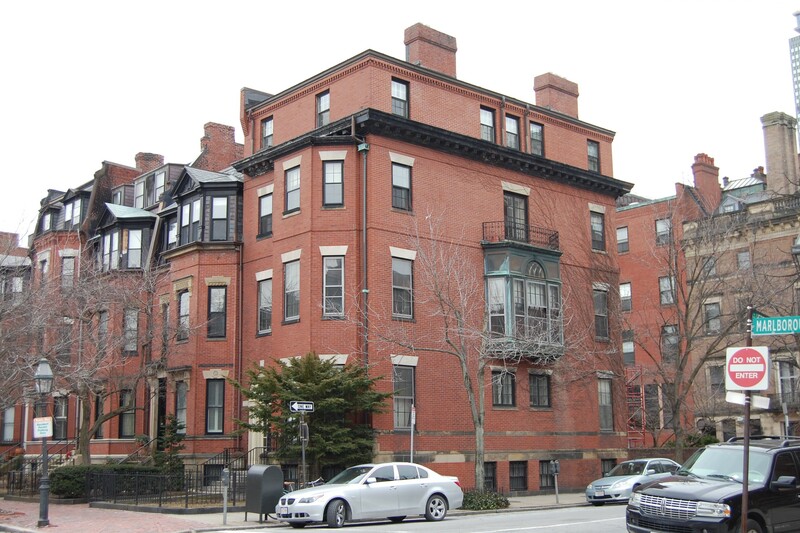 By 1910, Dr. and Mrs. Robinson had moved to The Stratford apartments at 31 Massachusetts Avenue. By the 1909-1910 winter season, 356 Marlborough was the home of John and Clara Purdon’s son and daughter-in-law, James and Josephine (Wilson) Purdon. They previously had lived at 405 Marlborough. By 1911, they had moved to 541 Commonwealth. On August 16, 1910, 356 Marlborough was purchased from John Purdon’s estate by Marian Sears (Bennett) Robbins, the wife of Dr. William Bradford Robbins They previously had lived at The Torrington at 384 Commonwealth. They also maintained a home in Ipswich. William Bradford Robbins was a physician specializing in internal medicine and an instructor at Harvard Medical School. He maintained his offices at 355 Marlborough until the early 1930s, when he moved his office to 356 Marlborough. In 1914, 356 Marlborough also was the home of Simon Burt Wolbach, a physician. He married in June of 1914 to Anna Wellington; after their marriage, they lived at 420 Beacon with her widowed father, William H. Wellington. William and Marian Robbins continued to live at 356 Marlborough until his death in January of 1951. On September 17, 1951, 356 Marlborough was acquired from Marian Robbins by Wallace Walker Cass. In October of 1951, he applied for (and subsequently received) permission to convert the property from a single-family dwelling into three apartments. Wallace Cass lived in an apartment at 541 Commonwealth in the 1950s and early 1960s, and was employed with the Fall River Shipyard in Quincy. After he retired in the mid-1960s, he moved to an apartment at 356 Marlborough. On November 5, 1983, 356 Marlborough was purchased from Wallace Cass by Robert P. Kingman, trustee of the 356 Marlborough Realty Trust. 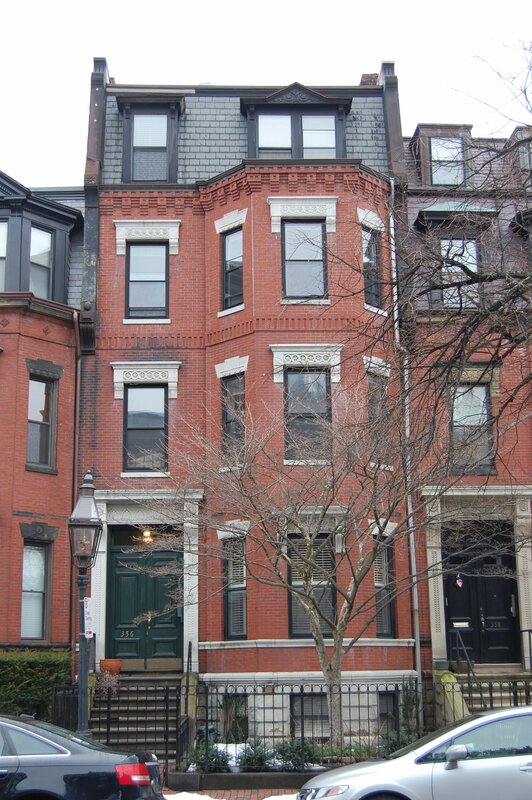 In December of 1983, he converted the property into three condominium units, the 356 Marlborough Street Condominium. In October of 1984, the condominium association increased the number of units from three to four. In October of 1989, the Robert Kingman Trust filed for (and subsequently received) permission to legalize the occupancy as four units.